15 / 366 - Went for a drive today and ended up in Lough Boora Parklands in Offaly. So set off around the Sculpture Park with the camera and tripod across my shoulder. Today’s picture is of “System No. 30″, a sculpture by Julian Wild. 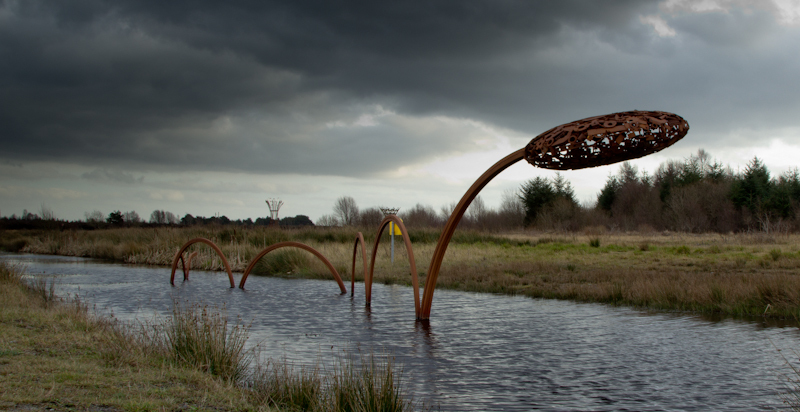 Made using two years worth of scrap metal collected from the Bord na Móna workshops in Lough Boora, John sees the process as a kind of archaeology in which each old cog and piece of metal tells part of the story of the sites’ rich industrial heritage. Welding these scrap pieces of peat wagons and cutting machinery together, the artist has constructed an 18 metre long sculpture in a canal at the parklands. 16 / 366 – Today’s photo was a night shot taken standing in front of the gates of St Agnes Church in Coralsown.